We live near a small river called Nissan, I am passing it more or less daily and have many times thought that I would like to paddle on it. I have paddled on it before, 27 years ago but for some reason I never paddled it since. So this easter we made som quick plans and took out or old canoe from the shed and went off. We started late in the afternoon but since the weather has been warm and the days are much longer now that did not bother us at all. What worried us more was if we would be up for the task since this was the first paddle for the year and we did not know how the river would be downstream. 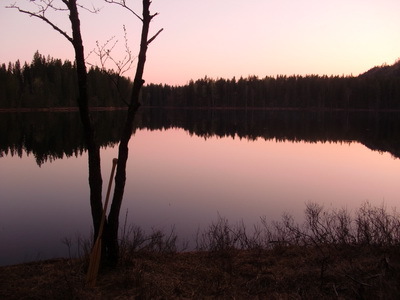 As soon as we sat in the canoe it was we had been canoeing all winter, the strokes and the feel was still there. 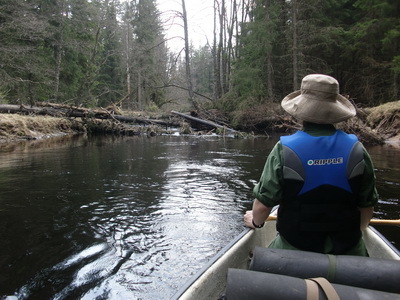 On the first day we had a very nice quiet paddle with load of new and old tracks of beaver. After a while we found a lean to and decided to stay the night. We did not make it very far this day either but after all the portages we were happy to set an early camp and enjoy the luxuries of setting camp. The third day was a bit different since this seemed to be small rapids day; we had gone a few the day before but not as many as today. These were quite small and no bigger problem but falling into the ice-cold water was nothing none of us wanting to try. Even though the rapids are small they do give you a small adrenaline rush. Since we are living together we have no need to talk all the time and sometimes just silently drift along the river and during these times we often got to get close to animals like the male deer we passed by that seemed as interest in us as we in him. It´s a nice experience to be just a few meters from a deer and be able to look into his eyes and just pass by without him even running away. This day was one of the weirdest portages I have ever done, through a golf course; the golfers must have been very amused seeing us carrying all our gear and a canoe across the golf course. 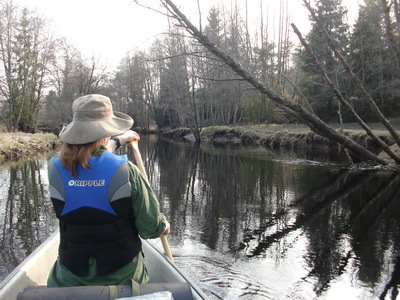 We also passed through lakes this day and I really missed the quiet river with it´s cool shade. Since we would be picked up the other day we were a bit limited we decided to stay outside Hestra were we found our own little beach. The last and fourth day mostly meant we were laying in the shade and waiting to be picked up and looking at the maps and talking about continue this journey another day and continue on the river all the way to the ocean. 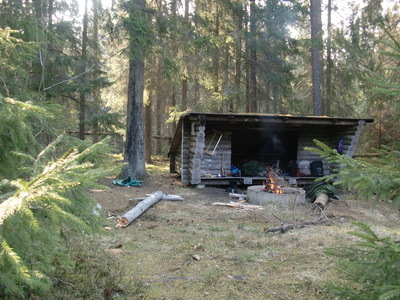 Detta inlägg postades i Nature, Nyheter, Ute och omkring och märktes canoe, nissan den april 24, 2011 av Johan, Nordic Bushcraft.